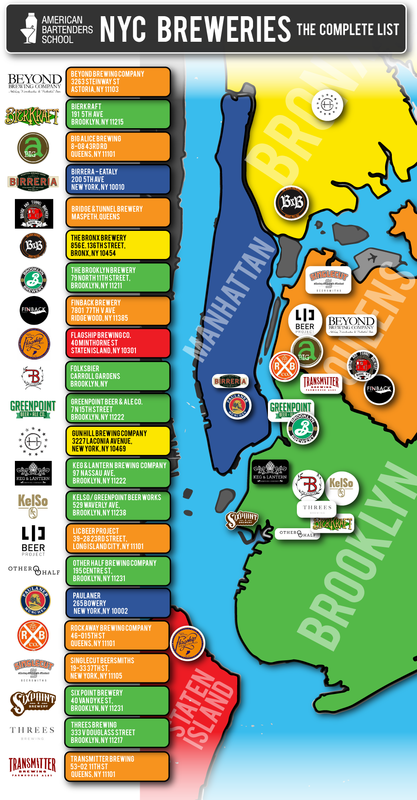 Do you know New York City has a total of 22 physical breweries! The breakdown goes like this: 11 in Brooklyn, 8 in Queens, 5 in Manhattan, 2 in the Bronx, and one in Staten Island. With this handy list, you can visit all of them (or you can at least try their beer!). It is important to note how we are distinguishing this breweries on this list: While you may find some other ‘breweries’ located in NYC, the cold hard fact is that real estate is hard to come by. A lot of folks are located in NYC, but actually forced to brew at other breweries upstate or in CT.
One of the important things about being a bartender is knowing the details about the beer you are serving. As craft beer continues to gain more interest and notoriety, you will find a lot more customers of your asking about it. Bartending school in New York is an easy way to learn about the basics of beer. American Bartending School teaches important lessons in beer, like the basics of brewing beer and some of the history of beer. If you want to know more about what we teach related to beer – drop us a line here. Also a little demystifier from Gotham Imbiber on the state of current and upcoming NYC breweries. So, without further ado – check out the list! Located on the extreme east side of lower Manhattan, this brewery opened in 2012. They currently have four beers on their roster, including Brown Ales and an IPA. These guys founded their brewery in 2010 and brew/sell kombucha as well as a very special type of beer. Through a brew process they’ve created, a portion of their kombuchas become probiotic beers. Each is brewed with a very unique blend of spices, or teas. Their brewery is also solar powered! This is one of the smaller breweries in the city, also known as a nano-brewery. This means each batch is very small, about 1/3 of a barrel. According to Big Alice, this size gives them the flexibility to be creative and experiment with different styles and within each style. They do indeed have experimental beer flavors, like the Galia Melon Sour Wheat and the Vanilla Prune Dark Caramel. Birreria is a rooftop beer garden at Manhattan’s Eataly. Located right by the Flatiron building, this brewery also serves delicious food. Their beers are brewed and served in cask ales. The head brewer here works alongside of Sam Calagione of Dogfish Head, Teo Musso of Baladin and Leonardo Di Vincenzo of Birra Del Borgo. They also have a retractable roof! This nano-brewery opened in 2012 and is located out in Maspeth, which is in Queens. Their beers can be found at a variety of bars throughout the city. They have a wide range of brewed beers like their Ol Gilmartin Milk and Oatmeal Stout, and their Red Bird Express Belgian Red IPA. This brewhouse opened in September 2014 and their first beer was a Rye Pale Ale. They have now expanded to four beers sold in very iconic tall, thin cans. Their four beers include the Bronx Rye Pale Ale, Bronx Belgian Pale Ale, Bronx Pale Ale, and the Bronx Session IPA. Their logo was designed by legendary Milton Glaser (who also did the I *heart* NY logo) and they were selling their Brooklyn Lager as early as the 1980s. But the brewhouse officially opened in 1994. They brew a variety of classic beers like a IPA, Brown Ale, Lager, and American Ale. One of NYC’s newest breweries, Finback released its first beers in January of 2014. Visit their taproom and you can try them all, from their Imperial Stout to a Saison brewed with hibiscus. This brewery is located out in the ‘forgotten borough’ of Staten Island. Open Thursday through Sunday for tours and tastings, they offer a handful of beers as well as a few seasonal beers to compliment the weather and your tastebuds. This microbrewery in Brooklyn has three beers currently, a German Ale, a Dark Rye Ale, and a Pilsner. They ‘make the best of new technology’ to brew beer ‘the old fashioned way’. Their beers are available at various locations throughout the city. This Greenpoint brewery is located at a bar/restaurant called Dirck The Norseman, which is also home to a few European outposts of beers: Cologne Germany’s Gaffel Kolsch, Friesland’s Jever Pilsner, and Augsburg’s Brauhaus Reigele. This is the smallest of the breweries-and technically not a permanent member of the NYC brewery community. They travel around to different breweries to brew their beer – so they are more of a nano-brewery or ‘nomadic’ brewery. Founders Joe and Lauren Grimm create single batch beers that may only come around once. Visit their website to learn more about actually purchasing them, but they are located in a variety of bars throughout the city. Founded by two local ballplayers, Dave Lopez and Kieran Farrell started crafting beers at their brewery in the Bronx in early February of 2014. Bonus – check out their website – it is a really cool design. You can visit their brewery for tastings and tours, but they are also available in bars. This is part restaurant/part brewery. They serve 9 beers that are brewed right on the premises, everything from Scottish Ale to a Sour Brown Ale. Open everyday from 11am to 4am. Located in Brooklyn, these guys actually have a really neat video of their brewing process on their site. Their tasting room is now open Thurs-Sun. This German brewery/restaurant is located on the Lower East Side of Manhattan. Home to the FC Bayern Munich Soccer Fan Club, it’s known for its delicious craft beer and German food. They also have brewing classes. This brewery got its starts by selling kegs to local bars at Rockaway Beaches. They currently have a brewhouse in Long Island City, so you don’t have to go all the way out to the beach to taste. They currently have five beers, including their signature english-style ale that started it all, the Rockaway ESB. Located in Queens, you can visit Singlecut’s Taproom to try out their beer selection. They currently have 10 beers on their roster, but 6 year round beers including 3 different IPAs, a Pilsner, and their Mahogany Ale. Sixpoint Craft Ales started in 2004 and have since grown. A few years back they sold their beers in 4-pack 16 oz cans, but now they have moved to 6-packs that resemble a Redbull. Their four core beers are the Resin, Sweet Action, Bengali, and The Crisp (our favorite). But they also have various seasonal beers. This 15 barrel brewhouse in Gowanus is also an event space and restaurant with rotating kitchen residency. Funded in part by Kickstarter, they are opening an outdoor space as well. Their beer roster is currently at 18 different beers. Located right on the border of Queens/Brooklyn, this brewery focuses on Traditional and Farmhouse Ales. So, you won’t necessarily be seeing any wild chocolate stouts or fruit-infused beers here. They also have a Community Supported Brewery program. That means for a monthly sum of $175, you get 2 bottles of their beer per month as well as some other swag like glasses and tshirts. These are gypsy or nomadic brewers who have offices in NYC, but don’t yet have their own brewery. I say ‘yet’ because some are working on it! Previous Previous post: Avengers Cocktails – The Ultimate List!